How to love words...and life | House Unseen. Life Unscripted. Last night my big girls and I finished reading Anne of Green Gables together. We've read a chapter (or three) a night together for the last few weeks and have enjoyed every moment of it. Even the heart-wrenching, tear-filled moments last night as we said good-bye to Matthew and sat with Anne during her first painfully sorrowful night. My Katie ran to get a box of kleenex when she realized we were all wiping our noses on our sleeves. I can't tell you how that book molded me as a child, shaping my appreciation for the perfectly constructed sentence and the timeless beauty of an autumn sunset. I can't tell you how it touched me as an adult, speaking to a child's need for just a little kindness in her life and an adult's need for a little magic in his. If you've never read it, read it now. If you've never read it as an adult, read it now. In celebration of our newest newest mother-daughter obsession, we will be scurrying to the library to pick up Anne of Avonlea today and swinging by the grocery store to pick up the ingredients for raspberry cordial and pound cake. Deciding to homeschool was the best thing we've ever done for our family. For their sake and for our own. My girls are old enough to read it alone, but there's something so magical about me reading it out loud to them. A real 'bonding' experience! My husband and I used to read aloud to each other. Kinda corny, but we loved it. We are just now entering the realm of chapter books with June and I love it more than she does. Love it when these moments "show" you things so clearly!!! 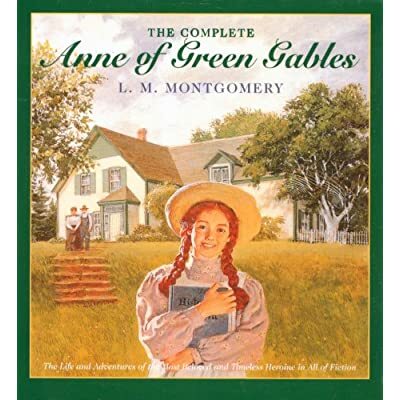 One of the best Christmas presents I ever got was the boxed set of the entire Anne series, from "Anne of Green Gables" to "Rilla of Ingleside." I still remember the resounding delight I felt when I opened the package -- up the that point I'd only read the first two and had no idea that there were more in the series. I still reread the entire series on a yearly basis. Also, if you haven't read "Jane of Lantern Hill" or "The Blue Castle," do so! They are my favorite non-Anne novels by L.M. Montgomery (my paperback copies are in tatters because I've re-read them so often). Honestly, I'm just a complete L.M. Montgomery fangirl. looks like I'm going to have to read it again! I think I read it just once; I remember my older sister loved it. We are just starting the Little House on the Prairie books over here and we love them. I plan on reading the "Anne" books when they are a little older and definitely with Lina. The Chronicles of Narnia as well. I'm glad you are happy you are homeschooling, it's so "full" in its own way, isn't it? I have the whole series. When they get a little older, I think the Emily books are even more poignant. When I was a kid I had trouble with Anne of Avonlea, and after that she started getting so much older...it's in adulthood that I've really appreciated both series. Making rasberry cordial and pound cake? GREAT idea! This is my first time here and instantly I've been drawn in and I want to know more, more, and more. Oh, Anne... I read the books as a kid and adored them. How they spoke to my outcast-heart and delighted my bookworm soul! She was my hero. And I can't wait to snap up some copies and re-read them! Always, always enjoy your words here, Dwija. Oh! I love those books. I cannot count the number of times I've read them. During exam periods, I would have to HIDE THEM AWAY so I could treat myself to the series once I was finished. Rilla of Ingleside was the first book that made me cry (I was 8). And Anne of the Island is probably my favourite. It's up after Avonlea. Maud's husband was the minister in a church 5 minutes from where I grew up, and she had a lot of ties to the University I attended. The archives have her draft copy of "Rilla" with her notes - I've seen it. It's awesome. My husband and I have known each other since grade school. Though I never broke a slate over his head, I do say that we're "Just like Anne and Gilbert". That's one of my favorite books! I just re-read it a few months ago. Another one I loved (and still do!) is A Tree Grows in Brooklyn. I don't know how old your girls are, but that's a good one! Isn't homeschooling HARD? Aren't you "on" at all times? PS. If you have an e-reader, you can get the Anne books for free from Amazon or Gutenburg. @Sarah- I love that you and your hubby are Anne and Gilbert. That. Is. Awesome! I have every book of L.M. Montgomery's and reread about once a year. I LOVE Anne of Green Gables; what a wonderful story for our girls to grow up with! Lovely! I read those as a child and I am excited to share them with my own kids. I *loved* the Anne of Green Gables series when I was growing up! (Have you read any of her other books? They're all amazing.) And I can't wait to read the books with my daughters. What a wonderful way to find the bigger picture! I ordered a boxed set of the Anne books today. I loved the story as a kid and decided I needed to get the rest and read them, then share them with the Little Tiger and whomever is currently gestating and will make the scene in March. I agree with you about homeschooling. It has enriched MY life in ways I never expected. Anne is the best. I stayed up late as a child (I'm talking like 3 am late) sneaking the light on in my room so I could read them over and over. Now I read them every year as an adult and the way of life expressed in the Anne novels, the farming/canning/knitting/sewing/handmade lifestyle really speaks to me and inspires me. And Anne, Anne just makes my heart happy, such a great heroine and role model. I've never read it but I've been meaning to. A few years ago, my dad called me up out of the blue to tell me about this great movie series he'd been watching on PBS that he thought I would like - Anne of Green Gables. Yes, my macho-man, hunter, fisherman father LOVED it and told me I had to read the books and see the movies! I'm so happy for you and your girls, with homeschooling working out so well. I can feel your joy when you write about it each time. I love, love, LOVE those books! They are wonderful. One of my favorite things about homeschooling was the chance to use the cookbooks that accompany some children's book series (like Little House on the Prairie and Anne of Green Gables.) The Creamy Vegetable soup in the Anne of Green Gables book was a standby during my childhood. Anne of Green Gables was one of my favorites when I was young. I can't wait to introduce it to my daughters! oh this is so timely! I love love loved this and the rest of the series when I was a little home schooler myself! #1 Of COURSE she will, Grace. Every fine young woman does, and I do believe I've already inducted Julia as a member of the EFYW (Establishment of Fine Young Women)! #2 Am I the only one who thinks is pretty awesome that there are two Middle Name Marie comments in a row? Anyone? Okay, I'm a nerd. I wish I read those books and maybe I will someday. Thanks for sharing. A joy of reading and love of words is absolutely the BEST thing anyone can be taught. It's a gateway to all kinds of words and lives and people and ideas. Looks like your girls are well on their way. Beautiful post. Anne of Green Gables is one of those VERY SPECIAL books, isn't it? Wow I love bonding over a good book! Should I wait until my daughter's older to read it to her?? She's only 10 months now. Sadly, I haven't read the books, but I have seen the movies! And loved them. I'm excited to be able to read these to Donut. Along with the Little House on the Prairie books!